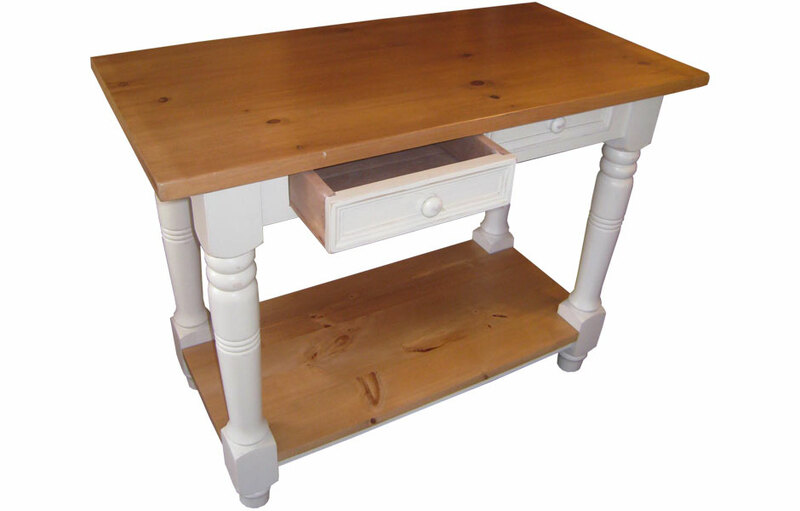 The Kitchen Island Work Table with turned legs and shelf. Available in two lengths: 4 feet long and 5 feet long. This island has sturdy turned legs, bevel-paneled drawers with wood knobs, and a lower shelf for storage. There are two drawers on the 48" and three drawers on the 60". For the gourmet or the quick cook, finding ample workspace in the kitchen can sometimes be challenging. This solid-wood kitchen island work table adds essential counter space for food preparation. The French Kitchen Island, Work Table can help you prep a meal more efficiently by providing essential counterspace, large open shelf storage and drawer storage. 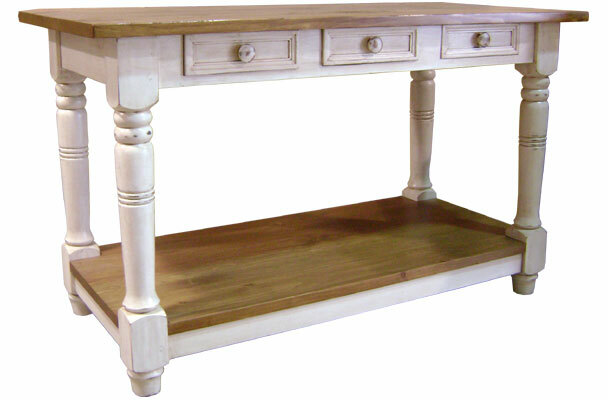 The French Kitchen Island, Work Table is built of solid wood. 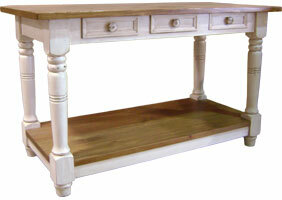 The tall, 4" hardwood turned legs add sturdy construction of the table. The kitchen island has useful drawers to store utensils and hand-towels. The durable, solid wood lower storage shelf accommodates large pots and appliances. The 1 1/8-inch thick top is made of solid wood, and is water-sealed and waxed to stand-up to daily use. The French Kitchen Island, Work Table is available in standard lengths of 48" long x 24" deep (4ft. ), 60" long x 30" deep (5ft.). The narrow island can work well into many kitchen styles. It's an elegant alternative to a kitchen cart, offering high-quality, sturdy solid wood craftsmanship. 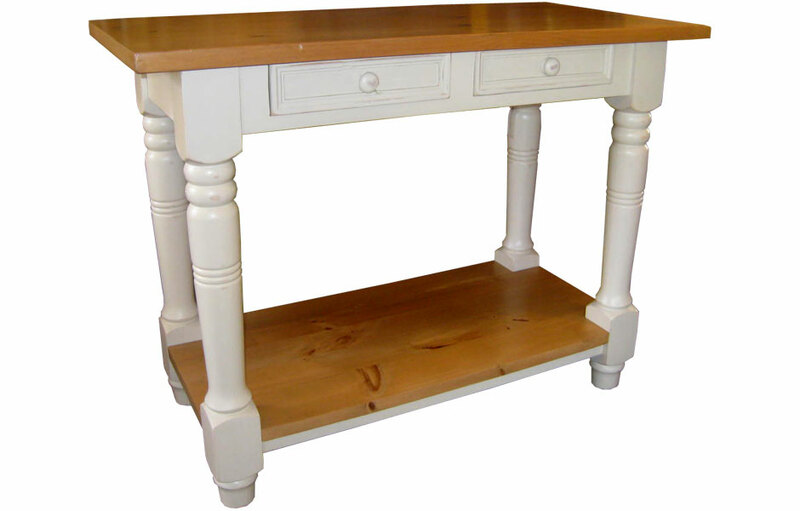 The French country Kitchen Island is standardly painted in a classic two-tone French country finish (stained top and painted base). But, can be finished in one all-over stain or paint finish. This French country kitchen island complements French Country, English Cottage, Farmhouse, Rustic, Beach, Transitional and Traditional style decors. "Vintage Pine" is made from reclaimed wood from old hunting cabins, buildings, and cottages. No two tops are alike, some are more rustic than others, they can be very distressed by their weather worn age. You should expect that some have divots and worming. 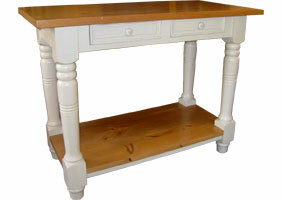 Kitchen Island Work Table, Champlain White. Kitchen Island Work Table, Champlain.